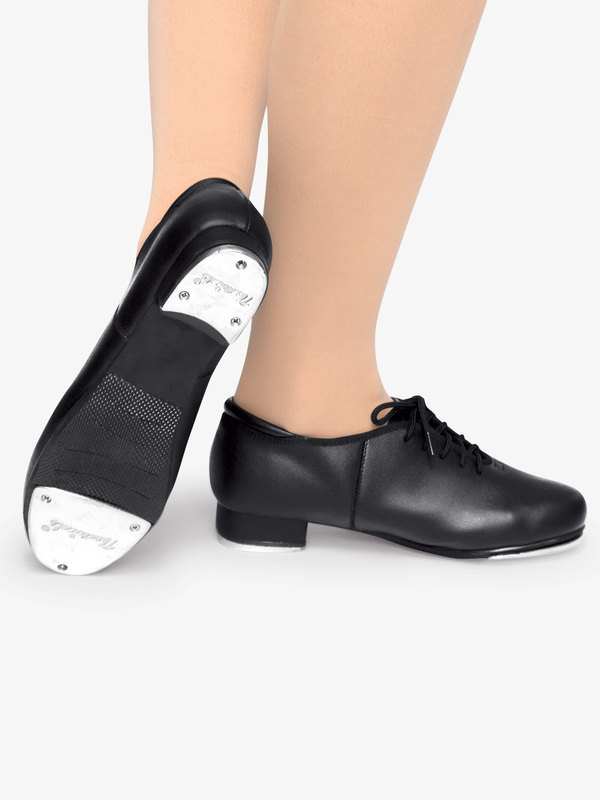 This classic lace-up jazz tap shoe features taps that come screwed on with a sound board underneath. Includes a sturdy heel counter, a non-skid rubber patch behind the taps, and a cushioned sock lining for extra comfort. I ordered these to my child's shoe size .My child wears a 11 to 11.5, I ordered an 11.5 and had to reorder in a 10.5. The sizing chart recommends using "street shoe size for children", but I have found that this shoe is small! The shoe I ended up with is 3 full sizes larger than my child's street shoe size! This may be unique to us, but it's a big enough size difference that I wanted to leave a review! We ordered these for my daugther. This is her 5th year of tap. These shoes by far exceeded my expectations. She needed something better than the patent leather start-out tap shoe, but I didn't want to spend the money on a higher end tap shoe for her. These shoes by far exceeded my expectation. I would recommend these for sure. Are there any problems with the screws falling out? This is considered a value shoe. The design of this shoe is constructed more for a beginner to wear minimally per week, where as a more advanced dancer, might wear through it faster. If you encounter an issue of screws falling out after minimal wear, you might have received a defective pair which is seldom, but would be able to return it for inspection and potential refund of the product. Does this tap shoe (T9500C) come in a size 2 or 3? This style does not come in a child size 2.0 or 3.0 The largest size is a child 1.5 You would need to convert the child to the adult shoe size. Please contact customer service at 1-800-470-1664 for assistance with sizing. how true to size do these actually fit? I'm buying these for a 6 year old that wears a size 12 street shoe. She does have a wider foot so I will probably order them in a wide. I don't want to hassle of sending them back a bunch of times if they don't fit. The sizing suggestion does recommend ordering true to street shoe size. However, this particular shoe does NOT come in a Wide width. You would be safe ordering a half size larger, as a half size only measures a quarter of an inch in length.